In Native American - Wise Woman tradition there is a philosophy, saying, that when a girl starts her moon cycles she meets her wisdom. As a woman walks through life experiencing and embracing her womanhood, her moon cycles, she is practicing her wisdom. When a woman transitions out of her monthly moon cycles, she becomes her wisdom. What a beautiful way to initiate young girls into the mysteries of womanhood, embracing the very energy and cycles that make her uniquely a woman and her own true self. What a way to remind woman of the divine aspect of their moon cycles, of their feminine being, the ebb and flow of their life in harmony with nature's cycles (we are nature). Wherever you are in your moon cycles: beginning flow of teen years into bleeding time womanhood and beyond, use your moon cycles to your best advantage. Recognize the power you have in the early, building, phase of your cycle. Feel your heightened intuition in the few days preceding blood flow. Acknowledge your need to relax and be quiet as you move into the blood flow days of your moon cycle. Use your wisdom "wisely" as you thrive in the moon free, blood free, years of your life. What might this awareness look like to you? During the first half of your cycle (end of bleeding to ovulation): say “yes” more often to the “new” opportunities, to people and gatherings, and to meetings and new projects. During the second half of your cycle (ovulation to next new bleed): say ”no” more often, focusing more on the “now.” Use this time to bring projects and events to completion. Learn to prioritize what really needs your attention and nurturing. Protect your alone time, your downtime, as you move into bleeding. Relax and increase your favorite self-care treatments. Get a massage or acupuncture treatment. Learn reflexology and acupressure. Use these techniques to do home self-care: gently massage areas that need healing touch. Treat yourself to a home "spa" day. Share your feminine wisdom with your daughters, friends, neighbors, grand daughters... make the path for the younger women easier and more sacred than what you may have experienced. Being female is an amazing gift. We are the creators. Revel in your divine feminine being, nurture her. PS If you are raising sons, teach them the wise women ways. Think how harmonious male-female relationships could be when we all understand, remember, wise woman ways! One of the biggest driving factors for me to work in the red tent movement is the fact that I have three young daughters. I want to contribute to their puberty, menarche, and budding femininity being reasons for joyful, excited anticipation. Our generation plays a wonderful part in that: we are the bridge, it is in our hands to initiate the transformation of femininity from shame to a power source. It was two years ago that my mother took me aside. When two of my daughters were staying with my parents, my mother found one of my cloth pads. It must have slipped into the kids' clothing after washing. She told me I had to be more careful and that it didn't do that my kids noticed something like that. When my father entered the room, she even sent him out, as if we were talking about something illegal. 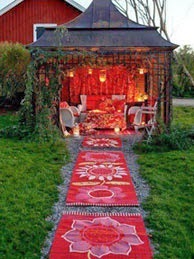 At that time I had only just heard of red tents on the internet. It dawned on me that, as long as women like her, after raising daughters and finishing their fertile years themselves, and are still so ashamed about something like cloth pads, our world is in desperate need of this work! A while back, my oldest daughter (she's almost 10) asked me loudly in the crowded school yard: "Mama, do you have a monthly bleeding?“ She had browsed through her science school book and her curiosity was aroused. Her 7 year-old sister was with us and all ears. Thanks to DeAnna L'am's wonderful Diva's Guide to getting your Period, for young girls, which I translated into German last year ("Tanz mit dem Mond“, available in the shop at my website), I had a beautiful, sincere and pleasant explanation for the girls at my hands. Just like birds build a nest before laying their eggs, so our womb builds a nest out of uterus lining, for when a baby starts to grow there. If we don't conceive, we shed the lining mixed with blood, which results in menstruation. We were not embarrassed. I didn't embellish anything nor did I tell horror stories. All was clear; the girls were content. They asked what a woman is doing with the blood and I told them briefly about cloth pads vs. disposable pads. Back when I got my first period, I was "informed" that this will happen because I have an older sister. Still, I didn't dare tell my mother about it. When she found out, it was an embarrassing, bleak affair when we talked about periods for almost the only time ever. I hardly believe that my mother was welcomed into womanhood by her own mother, so how was she supposed to do things differently with her daughters? How was she supposed to know that there was another way? It wasn't talked about, period (pun intended). Had I asked a question like my daughter did in public, I would probably have been silenced, and later we wouldn't have talked about it either. If we want to create a more open environment for our daughters, it is important to start with ourselves. How many of us carry around handed-down taboos, think of their menstruation as a curse and a burden, to only look forward to menopause because of the promise of no more bleeding, and would rather die than talk to anybody about periods? The good news is: We can still recognize, honour, and welcome the girl we were at our menarche into womanhood today. We can give that to ourselves and each other. We need the company of other women to break the taboos, to celebrate our femininity, to honour, and give each other space to be ourselves. We can call into being red tents, moon lodges, temple groups, or however we want to call our women's circles. There we get in touch with our own womanhood. Let's also bring our adolescent daughters into the groups, their energy gives us at least as much as the wisdom of age gives to them! Our smart daughters won't buy make-believe joy about their first period from us and don't suddenly feel like a real woman, as long as we can't honestly model to them that being a woman is a thing of power, beauty and dignity. As we heal ourselves, we heal the next generation, healing half of the world's population one woman at a time. This healed half radiates healing to the other half! Ambitious? Yes, and it works when we start with ourselves. Thank you Stefanie for sharing your story, your journey, a journey many of us lived as well. I am raising 2 beautiful male souls. They have always known what my moon cycle is. Kids ask questions. Kids hang out with mom in the bathroom (along with the cats, and the dog...). I never excluded them because I was "bleeding" and they should not know, see, be aware. They know and they will, hopefully, be better men prepared to embrace strong, powerful, divine women who are thrilled with their feminine energy and cycle! And then two months later, the time was right for us all. One of the women asked on Facebook if anyone knew of a women’s group or red tent in the area… and the flame was lit. Within an hour we had a FB group. And the other woman jumped right in as an admin, unbidden. Within a week we had a date and venue. In a month we have gotten over 100 women to our group, organically. We only invited 35 between us… the rest were just drawn to us. We have had minor bumps in the road naturally, including our first venue cancelling only days before. But we have a new, better space now. 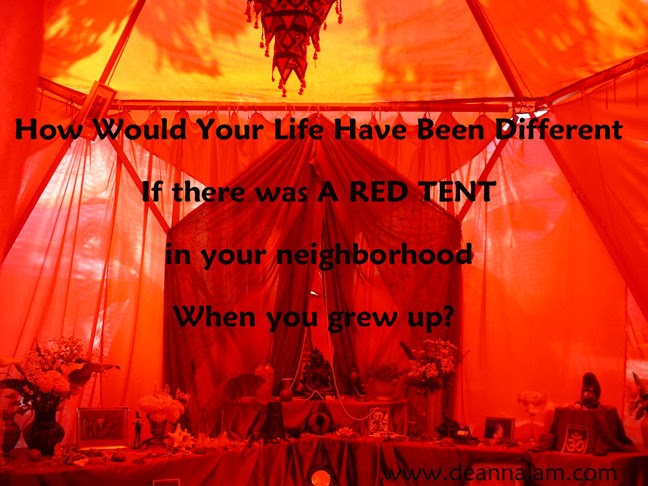 The Red Tent Movie - buy it, rent it, read the blog, watch a video from the maker on how to create your own red tent.